The access route used for draining unresectable biliary obstructions located at the hilum usually depends on the proximal extent of the obstruction: the endoscopic route is usually chosen in Bismuth types II and III lesions whereas the percutaneous route may be preferred for Bismuth type IV lesions. In the study by Saluja et al. 54 patients with Bismuth type II or III hilar obstruction were randomized for the placement of a single 10-Fr plastic stent via either the percutaneous route or the endoscopic route . Hilar obstruction was related to gallbladder cancer in all patients. Successful drainage was defined as a reduction in bilirubin below 50 % of baseline value within 7 days after the procedure. An intention-to-treat analysis of the data was conducted. Compared with the percutaneous group, significantly more patients in the endoscopy group experienced failed drainage (59 % vs. 11 %; P < 0.001) and complications at 30 days (52 % vs. 18 %; P = 0.04). Complications mainly consisted of cholangitis diagnosed within 7 days after the procedure (48 % vs. 11 % of patients in the endoscopy and percutaneous groups, respectively; P = 0.002). Early cholangitis in the endoscopy group was mainly attributed to stent dysfunction (26 % of patients) and incomplete drainage with ongoing cholangitis (19 %). All of the patients were followed up until death; median survival time was short (60 days) and identical for both groups. Quality of life and symptoms were assessed using three different scoring systems at various time intervals; globally, the improvement in quality of life after drainage by either technique was not statistically significant for most of the scores, and fatigue was the single symptom that improved in both groups. Therefore, the authors commented that stent placement is an acceptable option for relief of cholangitis or refractory pruritus, but that its role in patients with jaundice alone is less clear. This study is the third randomized controlled trial (RCT) comparing percutaneous and endoscopic biliary drainage, but it is the first one to recruit exclusively patients with biliary obstruction at the level of the hilum (28 % and 39 % of patients in previous RCTs  ). This difference is important because the previous two RCTs reported results that were contradictory to those of Saluja et al. (i.e they showed significantly higher morbidity with the percutaneous route), and endoscopic biliary stenting is more difficult at the level of the hilum than at the common bile duct (as recognized in the Schutz grading system for difficulties at endoscopic retrograde cholangiopancreatography [ERCP]). In the RCT by Saluja et al., the 7-day incidence of cholangitis after attempted endoscopic stenting (48 %) was among the highest rates reported to date for endoscopic hilar drainage. For comparison, corresponding figures reported in nonrandomized trials were 11 % in a prospective multicenter study , and 0 % – 6 % in two single-center studies that used computed tomography (CT) scan or magnetic resonance cholangiopancreatography (MRCP) to target unilateral biliary drainage to the most dilated ducts  . Saluja et al. offered no explanation for these discrepancies, but neither the choice of stent (plastic rather than metallic) nor the performance of intention-to-treat analysis may be responsible, as some of the studies cited above also used plastic stents and excluded only 6 % – 14 % of patients from the analysis. 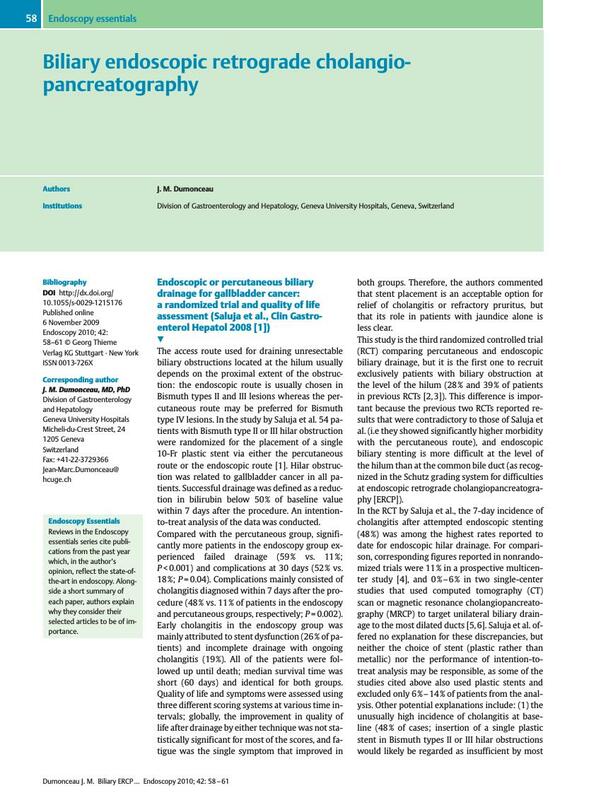 Other potential explanations include: (1) the unusually high incidence of cholangitis at baseline (48 % of cases; insertion of a single plastic stent in Bismuth types II or III hilar obstructions would likely be regarded as insufficient by most endoscopists in such circumstances); and (2) technical problems, as suggested by the high rate (26 %) of early (< 7 days) stent dysfunction (e. g. only straight stents were used and their proximal ends may have impacted into the bile duct wall when draining the left hepatic lobe). Median survival (60 days) was also poorer than in most other series; this was likely related to the high incidence of cholangitis and to the etiology of hilar obstructions (gallbladder cancers in all cases), as survival times were identical for both groups. At the present time, no definitive conclusion can be made about the best strategy for hilar obstructions. It is commonly accepted that, in patients with suspected hilar cholangiocarcinoma, MRCP should be performed first in order to assess resectability. This possibility should not be disregarded, as postsurgery survival has markedly improved since the introduction of techniques derived from liver transplantation, which permit larger resections to be carried out. If palliation is selected, in the absence of cholangitis, MRCP will allow selection of the dominant liver lobe for drainage with a single stent. The route chosen for drainage will depend on local expertise and, if this is not optimal, referral to a specialized center without delay is the best option. Whichever route is selected, it must be realized that failure is associated with a significantly shorter survival  and alternative drainage (e. g. percutaneous or transgastric under endosonographic guidance) should therefore be performed immediately if initial drainage has failed. Finally, for palliation, metal stents are usually preferred over plastic models, except in particular circumstances (e. g. photodynamic therapy, as trans-stent light delivery is decreased).